Alex's Rain-Themed Baby Sprinkle Mama Say What?! | Mama Say What?! Like most of us MSW mamas, Alex and I met while planning our weddings (well, I think she had *just* gotten married when I joined Project Wedding… but I digress). We were friendly with each other, but it wasn’t until we were pregnant and had our boys that we became real-life friends. I knew the first time I met her “in real life” that we were going to be friends for a long time. Little did I realize how great of friends we would become. Our boys are BFFs and we have traveled all over together. Although she and her family live in Utah and we live in Southern California, I knew when she became pregnant that we had to be there for her second baby’s sprinkle in Northern California. On a beautiful Saturday in the bay area, her friends and family came together to celebrate her new little man. And boy, did we have fun. 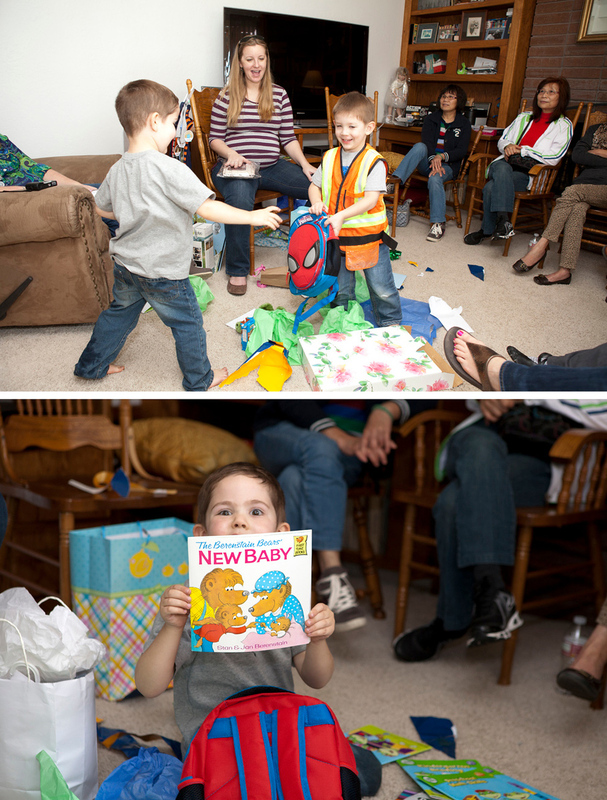 When I was pregnant with my second baby, my mom wanted to throw me a baby shower. She is of the belief that mamas deserve a shower for every one of their babies, even if they don’t need any new baby gear. I think she just likes any excuse to throw a party, so who was I to argue? In defense of second time mamas (or third and more), my boys were going to be four and a half years apart and born in exactly opposite seasons. I actually did need a few things, so my mom encouraged me to create a wish list on Amazon. Given that we’d done this newborn thing once before, my list was short, mainly restocking some necessities (breast pads, pump parts, some weather-appropriate clothing) and a couple of new items that I would have liked to have when my oldest was born. My family and friends were so incredibly generous. Since I am an artist, I was happy to design the paper goods for the party while my mom hosted and put together a delicious spread of food. 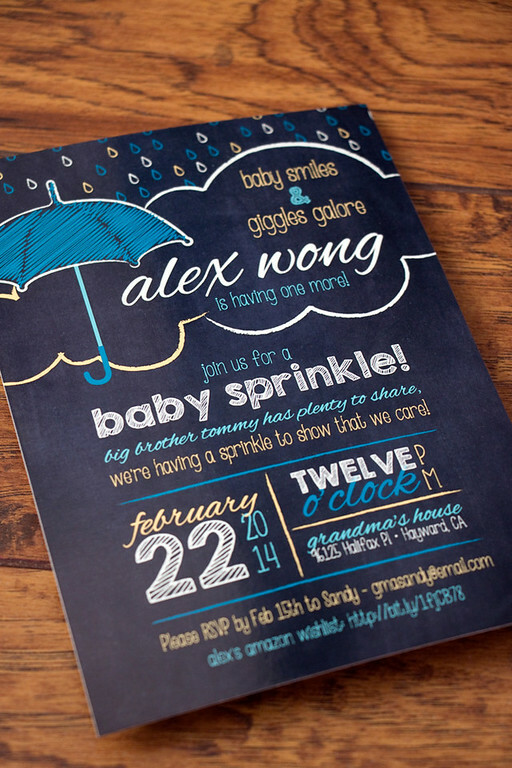 When looking up ideas for a baby sprinkle, I saw a lot of parties that were “rain” themed. Since we were having the sprinkle at the end of February in the San Francisco Bay Area, the odds of it raining that day were pretty good, so we stuck with that theme. Funny enough, it ended up being a gorgeous, warm and sunny day. Was the sprinkle co-ed or ladies only? Why did you decide to go that way? It was mostly ladies only, but men were definitely welcome. My son, husband and my dad were there as well as my sister’s boyfriend and Cari H’s son N. They didn’t participate in the games, but happily shared lunch with us. And both preschoolers were happy to help open gifts. Cari, her son and her mom gave my son a “Big Brother Kit” that he brought with him to the birth center when I was in labor. It was such a heartfelt and useful gift! How far along were you? Did you know the gender? Did that make a difference in the theme? I was about 32 weeks pregnant and knew we were having a boy. It didn’t really influence the choice in theme, but it did influence the colors a little bit. What was your favorite element of the shower? I’m really proud of my mom and the delicious food she made. We kept it low-key with just a variety of salads and a sandwich platter, but everything was delicious. Did you work with any vendors? Not many. I designed all of the paper goods myself including the invitation and printed party decor. My mom made most of the food and ordered a tray of sandwiches from Safeway. She ordered the delicious lemon cake from Vienna Bakery in Fremont, CA. What was your favorite game that you had at the shower? My favorite game was actually guessing the circumference of my belly. Everyone had to cut a piece of yarn the length they thought would wrap around my belly. Then I walked around and we measured to see who was closest. It was comical to see the vastly different lengths guests came up with. The varying lengths were really funny. We also played baby-themed Pictonary. It was hilarious to see how hard it was for someone to draw stretch marks, a breast pump, or a doula. Tell me about the details. Did you have favors? Decor? 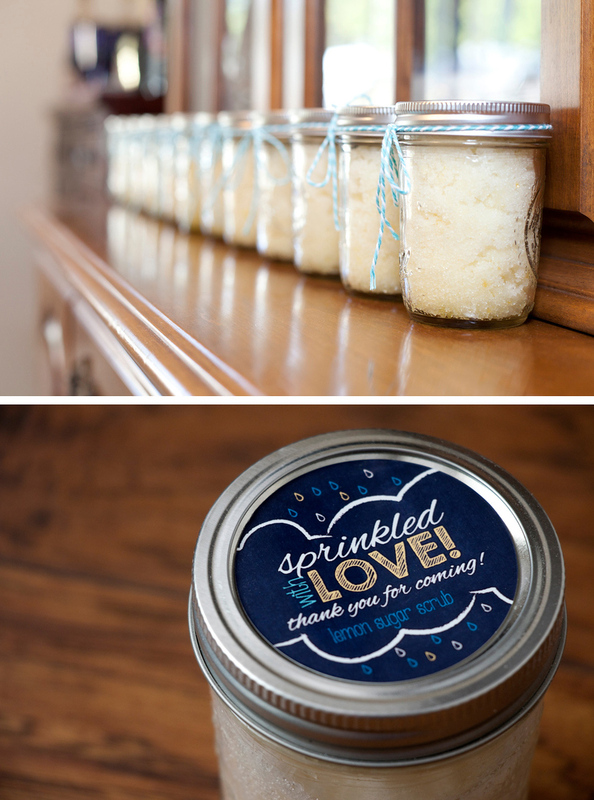 For favors, my mom made lemon sugar scrub and put it into half-pint mason jars. Then I created a label that we adhered to the lids and added some baker’s twine to make them pretty. I need to ask my mom for the sugar scrub recipe. I really love it! 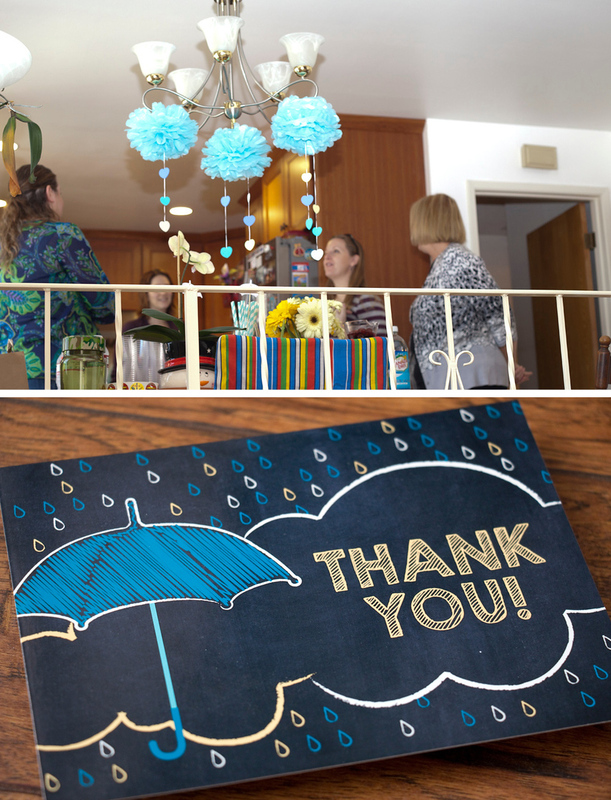 I had a lot of fun making some fun decor items for the sprinkle too, including a sign for the front door, little umbrellas to stick into food and “Wishes for Baby” cards that guests filled out as a fun keepsake for me. There wasn’t any specific moment that was my favorite, but just spending time with my friends and family, many of whom live far away, really made the day for me. Cari and her son drove up from the San Fernando Valley for the weekend. Cari’s mom came from Utah. My sister and her boyfriend also joined us from Los Angeles. While receiving gifts was wonderful, getting to spend that time with my friends and family before my little boy was born really made the day special for me. What advice can you give to our MSW readers that are planning a shower (or sprinkle) for their friend or relative? I believe all mamas deserve some sort of celebration for every one of their pregnancies. Whether it’s a shower, a sprinkle, or a get together after baby is born called a “sip ‘n see.” If she doesn’t need or want any gifts, shower her with love, support and advice. If the mama-to-be truly doesn’t need any baby gear, then consider organizing the gift of meals for her family. Get together with her friends and family and set up a Meal Train so the new parents don’t have to worry about cooking dinner for a couple of weeks. Connecting through Facebook is a great way to get started and it can be a huge help. If you don’t live close to the mama-to-be, then consider sending a gift card from a restaurant local to her. You really can’t go wrong with a gift of food. Added by Cari H. on August 21, 2014.